I got back into some more Blendering since my last outing with my Nova Helmet debacle. So this time I truly graduated up to the latest Blender 2.5 beta, which at this point is 2.56.0. I was modeling some more armor parts and I needed to create a hole. Previously, most of the stuff I worked on in 2.5 were things I modeled in 2.49 and just opened up in the 2.5 beta. This time I actually started from scratch in 2.5, and that’s when I ran into problems with cutting a hole in the mesh. Here’s the Blender 2.49 version from Kernon Dillon of Blendernewbies.com. You’ll see that at one point he clicks the “To Sphere” button. I couldn’t find that button in 2.5, so I Googled it and found that no one else seemed to be able to find it either. Luckily enough, they had the keyboard shortcut handy. For “To Sphere”, you just press alt(option)-shift-S to go into “To Sphere” mode. After that moving your mouse to the right will make your points align in a more spherical shape. Anyway, you can check out the video for more details, but that “To Sphere” was really the only showstopper between 2.49 and 2.5. Happy Blendering and let me know if you have any further questions. Thanks for sharing this nice tutorial. I’m still learning about using this thou. 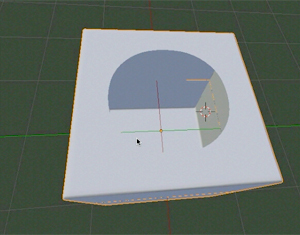 It has been helpful to know the command to areas in blender did not know where it was.